Anthony Pearson, who DJs as “Chez Damier,” had a big house moment in 1992, with “Can You Feel It,” and a few less big ones during the next three years. His hit — a soulful celebratory saunter — remains loved and was influential at the time; and his follow-ups — softly pining, as if for lost marvels — often find their way into sentimental DJ sets even now. Still, Chez Damier was, even in his moment, a brief presence. That he was able to be found, so many years later, and booked for Cambridge, MA’s “Re:Set Wednesday” DJ series certainly surprised this writer. Even more surprising, he attracted about 150 fans welcoming him like a hero returned from an epic past. Damier’s set pleased his fans and then some. Dancers bobbed and contorted themselves, raised their hands, screamed. Local DJs came to see him. Hardly anyone left early. Even at the one A.M. closing time the dance floor squeezed shoulder to shoulder and cheering. And why ? “All going back to the basics,” one knowledgeable observer — himself a DJ — told this writer. 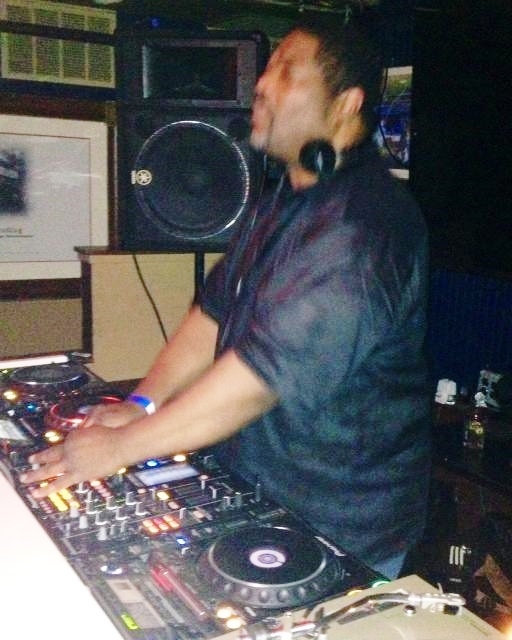 Damier used basic equipment ; two CD players and one mix board. He alternated just a few CDs. He played Brazilian beat first, then a long stretch of saxophone solo and bassline, as bebop as any house tracks this writer has heard; whence he jumped to Gino Soccio’s electro-techno “Dancer,” an iconic 1979 hit; from “Dancer’ back to saxophone solo bebop — this time with a tooled-in diva voice shouting “be real !” followed by some 1970s funk, Brazilian beat again and, lovingly, the soft stomp and roll of “Can You feel It.” Which Damier used as intro to another, even bigger 1992 hit, Jaydee’s “Plastic Dreams,” whose ten-plus minutes of reverb riff Damier improvised upon at length. It was his set’s strongest DJ segment. The music ragged and shagged. Damier’s mixology often failed him. Overlays forced themselves onto the under. Quick cuts jarred. He squeezed and stuttered the music pretty much one way all set long. His clunky narrowness reminded me of two-chord rockabilly, or of shack-porch blues men from the 1920s and 1930s piling an entire repertoire onto one or two melodies. Perhaps this was the point ? Because if it’s 1992 that is wanted, one turns first to Kerri Chandler, with whom Damier at that time often collaborated. Indeed, they plied the same piano-led, soft strut and shag. But Chandler wields flawless mixology and a far more diverse bag of mix moves, and he remains a world wide star: no rediscovery needed. Damier at Re:set sounded like Chandler in 1992, trial and error finding his voice not yet found. His appearance in front of 150 adoring fans, who gave their all to him, reminded this writer of Newport Folk festivals of the mid 1960s, when all those 1920s blues men — long since forgotten and left behind by musical developments which carried off their fans — came back to show a new generation — of very different people — how music was flavored at a time when all to come had not yet be found or tasted. In life, one so wants to retaste great meals eaten; to redo great doings that should, by all justice, have more than just one pass through one’s life. And so kids hardly old enough to have known Chez Damier in his 1992 moment — and utterly unlike the 1992 audience of, mostly, bourgie Black collegians, Black gays, and Black trannys — came to see that moment in person. To love it not as a social setting, because that they cannot do or, likely, even imagine. To love it, instead, as the music it is: flaws, geegaws, and simplicity, soul and sentiment, without floss or gloss; just the basics. NOTE: Together Boston, now in its fourth year, co-sponsored this booking. Expect much more of this sort of connoiseur’s event planning from Together Boston’s knowledgeable board of EDM fans and DJs.